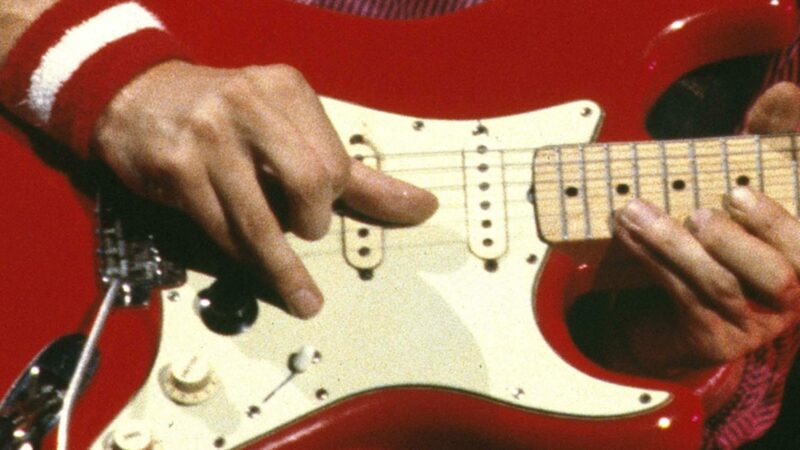 Mark Knopfler has used a volume pedal almost since the very first beginning of his career. He does not only use it to adjust the overall level, but also for his characteristic volume swells that make a note fade in just like a violin. In short, he hits the note with the pedal all the way back to remove the attack, then presses it down to fade in the note. 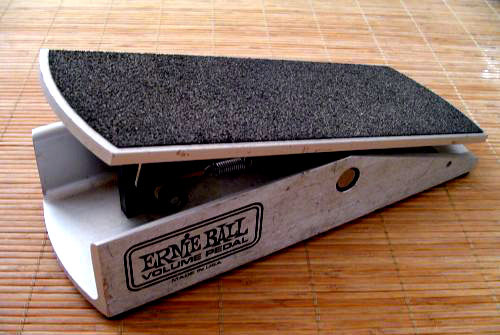 For the first years he used a Morley volume pedal, but later he changed to a model by Ernie Ball. This is common knowledge that can be found everywhere in the internet. I bought one of these Ernie Ball pedals many years ago. However, I found out that mine basically does what it is supoosed to do, but in detail there seem to be some differences to the way Knopfler’s pedal works. Over the years I had some good opportunities to watch him operating the pedal on stage, and I noticed that he often takes volume back to let’s say 70 – 80 % of the pedal way (100% = all the way down, full volume), and the volume of the guitar becomes slightly lower (maybe also 70 – 80% volume). When I set mine to 70 or 80%, the volume is considerably lower, maybe just 50%. In other words, mine changes the volume quite a lot as soon as you take it back just a bit. This makes it rather hard to set the volume to the desired level, one fraction of an inch too much and it is too low. I also noticed that he can create very ‘fast’ volume swells easily, which means the attack is filtered out but the note comes in quickly. When I do it, the volume comes in slowly, I have to press it down a rather long way – and very fast – until the note really cuts through. Mine behaves like the blue curve (comes in slowly while the last inch of the pedal way changes a lot) whereas Mark’s rather does the opposite (red curve). I found the solution in an interview with Mark’s guitar tech Glenn Saggers. He said that Mark is only happy with a particular poti that Ernie Ball once used, but which is not installed in later models anymore (some recent models allow you to change this curve by the way). They even gathered a supply of that old potis in case it worns out and must be replaced. I later tried a second and even a third Ernie Ball pedal, but all of them had the same curve as mine. There is one side effect of this which I have to mention. This way the pedal swallows some treble end when not pressed completely down (all potis do so but this way the effect is a bit extremer). However, this is no problem for me since the softer tone fits nicely to low volume, while full volume cuts a bit more. If you use one of these and have the same problems, try it out and let us know what you think about it. Update: I recently found out how to modify all those Ernie Ball pedals with the wrong curve (basically all after the mid 80ies). The Dan Armstrong Orange Squeezer compressor – Did Mark Knopfler really use it? ⟵Anything better than a red Schecter Strat? – Yes, two of them. 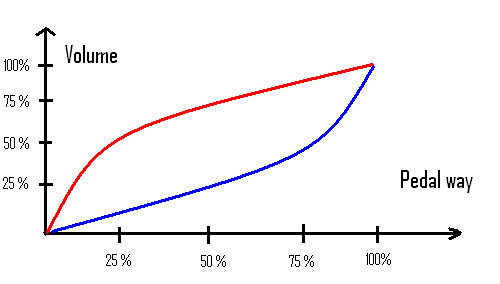 From the graph I would suggest the only difference is that the blue one is an audio taper pot (A) and the red one is a linear pot (B). Thanks for the very informative article! It’s very interesting especially because I wanted to buy a volume pedal myself these days though I think I might go for the Fender Volume Pedal that also allows you to change the tone. But I’m definitely going to give the Ernie Ball a shot as well. Another great article, Ingo! Tanks! I have played the guitar for many years, both in studio and on stage (and in rehearsal rooms of course), but never played MK/DS songs (only at home). Now, at last!, I’m hired to join a band which is going to play the whole Slow Train Coming album at some shows in some churches (!) in the Oslo area in march 2009 (Slow Train Coming 30 years aniversary concerts). The reason that I’m hired for this job is of cours of my love for MK’s guitar playing. And to get the sound right, I’ll have to purchase a volum pedal. As you mention in your article, EB makes a pedal that can be ajusted when it comes to volume curve (the same pedal as makes you connect the tuner directly to it, so that you can use the tuner when the pedal is in full back position (no sound). But my question is: Does anyone know if this particular EB pedal is ok for the MK sound? Does it solve the wolume curve problem that Ingo referes to? Don’t know about the new EBs, you might also try the Morley pedal that Knopfler played at that time (Slow train coming), it changes the sound a bit. I was just wondering if you know the name of the particular model of the pedal? The ERNIE BALL EB-6166 looks quite like the one on your picture though the current models might have different names than the older ones. But the spec sheet of the EB-6166 also mentions the possibility of switching to different sound curves just as it says in your article so that’s probably the one? That’s the 250k poti used in the 6166 mono Pedal model. So maybe you might be right and the currently available pots won’t manage the volume adjustment in the way the “red curve” shows it. Have you tried one of these pots, so far? Hi, love your site its what I need to educate myself on Mark. Which effect would u suggest i get to get the sound in Sultans of Swing, also do you haev any tabs or instructional videos you could add so I could learn more songs like Six Blade Knife and other songs. Will swapping the input and output jacks damage the pedal? Is the volume pedal, pictured above, the actual one you own? I own an older style as well with the open front and the jacks on the right hand side. Does yours have the black knob on the outside like mine does? If so, do you know what it is for? Mine doesn’t seem to do anything at all. I own one and the mechanism is not rocket science. It appears that EB uses a standard pot with a special “spool” attached to the shaft for the string. You could order a 250K reverse log/audio taper pot. Then take off the “spool” on the old one and attach it to the new one and solder the new on in. In fact when I get home am going to take a close look at the pot that comes with the pedal. Did a little more research and all you need to do is connect a 220k resistor from the wiper of th pot to output. My EB actually has a switch underneath the pedal that you can switch to turn this taper on and voila. I was going to say swap the input and output as the lines are the same shape just rotated 180degrees. One thing is missing here as far as i can see. Knopfler used to reverse the volumepedal (top down) so it’s easier to control with heel, especialy when simultainiously singing. You just stand on it actualy and drop the heel instead of pushing with the toes. Some of your early day pictures actualy show this setup. I think in a song like “Lions” the swells would have been difficult to achieve the normal way. Dont know if he dropped this habbit in a later stage. Looking back into it again it seems the Morley he used has a strange kind of angle to it (the way it’s rocked back an forth). For years i have thought he reversed the pedal and never gave it a further thought!! I would go for the 250k version, no matter if the guitar is active or passive. I noticed something whilst watching the Rockpalast performance on YouTube. Check it out at 40m:40s. Looks to me like Knopfler is using the pedal backwards !. Hi, I have a 90s 6160 pedal, it’s getting a bit scratchy, what pot do you recommend?